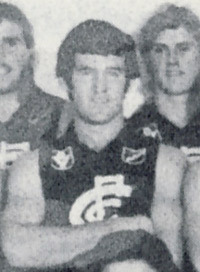 No relation to Mike Fitzpatrick (although their careers at Carlton coincided) Peter Fitzpatrick joined the Blues from Golden Square in 1978. He showed glimpses of real ability in his nine senior games, but found the going tough when he was forced to compete for a place in the team against the likes of Jim Buckley, Wayne Harmes, Peter McConville and Barry Armstrong. Later, Fitzpatrick bobbed up at St Kilda in 1980. He managed another four games for the Saints, then moved on to SANFL club Woodville for the 1981 season. In 1982 he move back to Victoria and played for VFA club Sandringham in which he would later captain in 1987 and 1988, he was also a member of their 1985 premiership team. In 1989, he transferred to arch-rival VFA club Port Melbourne after a falling out with Sandringham coach and ex Hawk Bob Keddie. In 1975, Fitzpatrick won the Bendigo Football Leagues Best and Fairest in the U/18's competition whilst playing for Golden Square. Contributors to this page: Jarusa , Bombasheldon , molsey , tmd1 , PatsFitztrick , TruBlueBrad , WillowBlue and admin . Page last modified on Thursday 18 of May, 2017 23:00:08 AEST by Jarusa.